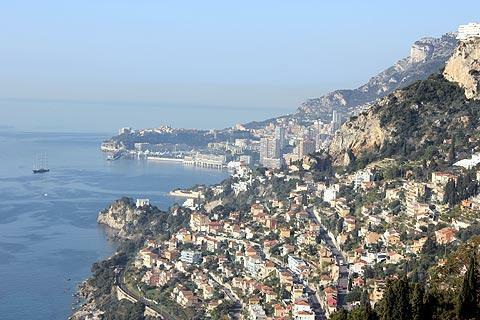 Roquebrune-Cap-Martin is a coast town on the Cote d'Azur, between Menton and Monaco in south-east France. In the early decades of the 20th century Cap Martin was the place to go and be seen, a hangout for the rich and famous of the time, and although this role has now moved elsewhere there are still some notable highlights. The town falls into three distinctive parts: the historic village of Roquebrune on Mont Angel high above the coast; the resort and more recent town centre along the coast below; and Cap Martin itself, a peninsula that is now home to luxury villas. 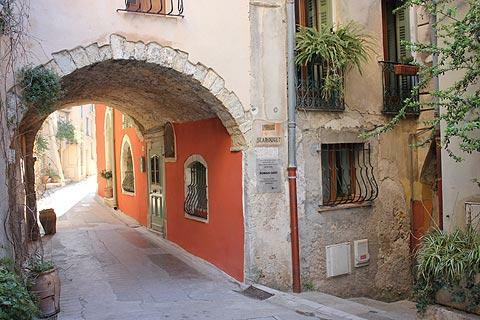 Although they are grouped together under the name Roquebrune-Cap-Martin the historic village is several kilometres from the coastal regions - an important distinction when you are booking accommodation here. 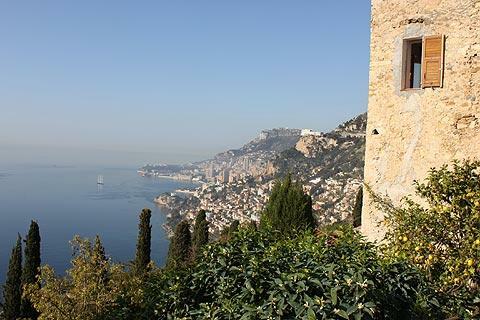 There is a series of steep staircases that climb from near Roquebrune-Cap-Martin train station up to the village but its quite a long steep walk! 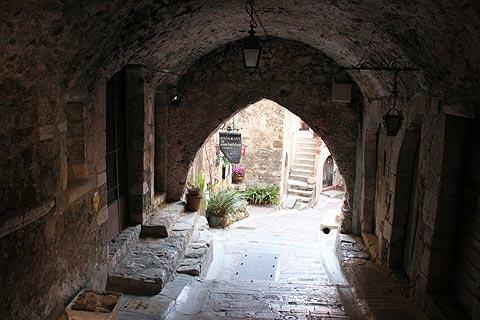 The pretty medieval village, overlooking Cap Martin in one direction and along the coast across Monaco in the other, has lovely narrow streets to explore winding between beautifully restored medieval houses. 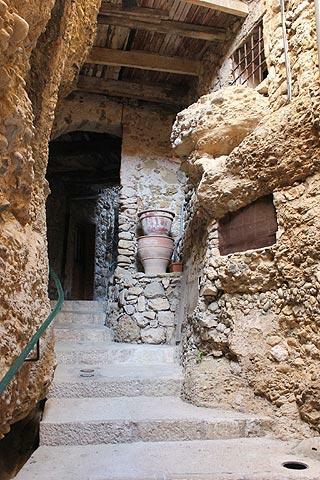 Some of the narrow passageways are vaulted and covered, adding further to the enjoyment of an exploration - indeed one of the streets is probably the lowest vaulted street I have ever come across! 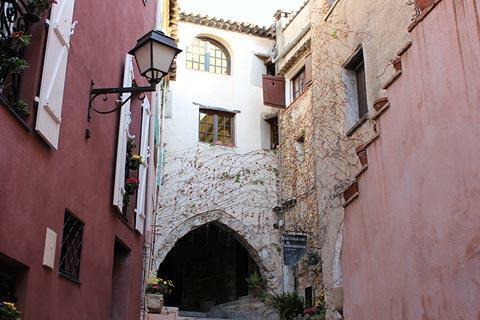 Roquebrune village is best known for, and dominated by, its castle. The was castle built in the 10th century to keep the saracens out and the castle donjon is thought to be the oldest in France. 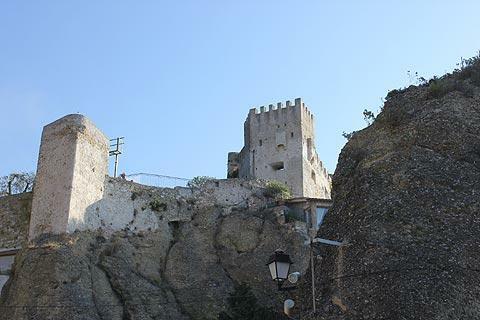 Much of the castle we now see was added later by the Grimaldi family, once very powerful in the region. 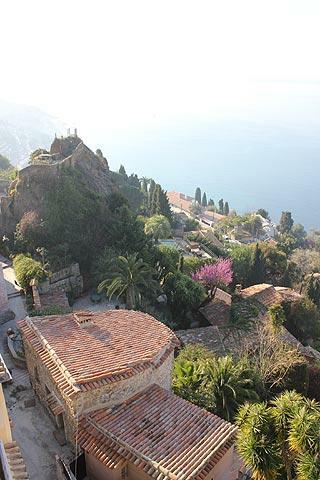 It is from inside the castle (admission charge payable) that you have the best views in Roquebrune-Cap-Martin, across the village rooftops and an extensive length of coastline. 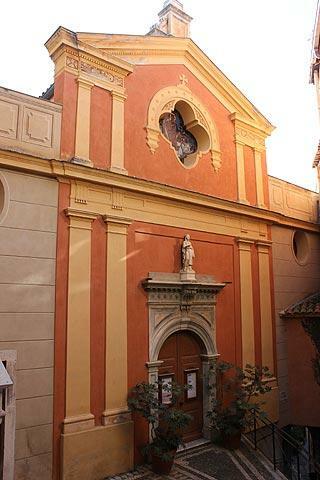 In the old village of Roquebrune you can also see the Church of Saint-Marguerite which dates from the 12th century but was substantially rebuilt in 1573, and then further enhanced during the 17th century and again in 1750, then redecorated in the 19th century to gain its current appearance - hence the colourful baroque style facade. The inside of the church is beautifully decorated with paintings and a frescoed ceiling above the altar, and a 19th century copy by Paggini of Michelangelo's Last Judgement. 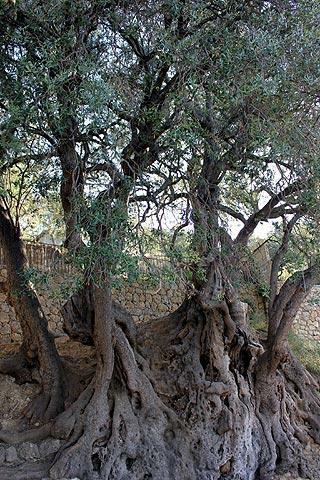 There is also an ancient olive tree on the edge of Roquebrune that is said to be one of the oldest in the world at more than 1000 years old: the tree is 200 metres along a lane that heads east from the top of the village and is clearly signposted. There are two small historic chapels further along the same road. The town below is where you will find the beach and all the major commerces for the town. There are also several very distinguished villas and gardens constructed in the early years of the 20th century, many dating from the period after 1904 when the peninsula was divided and building plots sold. 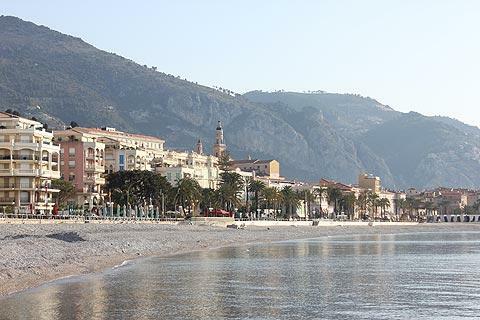 While the sea front loses something in grandeur and focus when compared with its neighbour Menton there is a long pebble beach, and a second beach to the west of the Cap Martin peninsula. 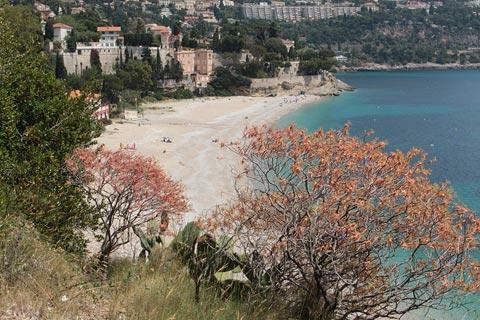 The broad promenade area continues all the way from Cap Martin peninsula to Menton. 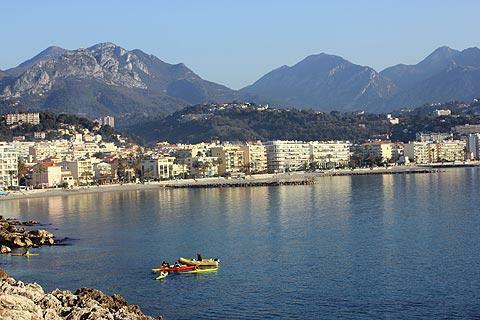 Note that the resort and Roquebrune-Cap-Martin tourist office are close to Carnolès train station, to the north-east of Cap Martin peninsula. The beaches closer to Roquebrune-Cap-Martin train station, north-west of the peninsula, are much smaller and with very few shops and cafes. 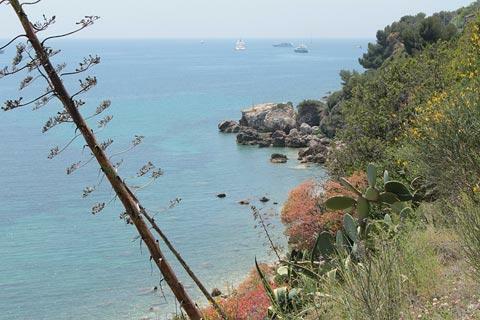 There is a very pleasant coastal walk that follows all the way around Cap Martin that starts from just below the village and is named after the architect Le Corbusier who drowned here in 1965. 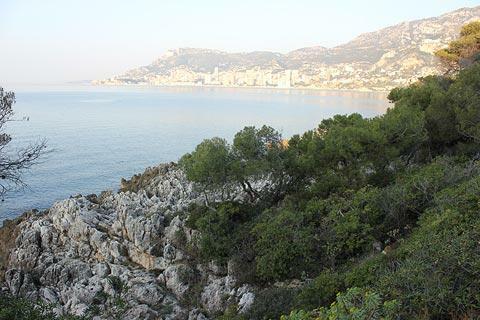 The walk takes about 1 hour and has lovely views across to Monaco on the western side and to Cap Martin resort and Menton to the east. The path is also popular with early morning joggers. 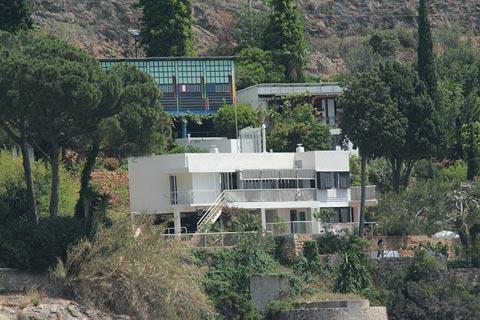 It is along the coastal path (or by boat along the coast) that you can see a modernist house called Villa E-1027, built in the 1930's by an architect called Eileen Gray. Every 5th August there is a religious procession through the town, giving thanks for the relief that the people received during an attack of the plague in 1467, so this is a good time to visit if you are in the region in the summer. There are many interesting destinations nearby, with historic towns such as Monaco and Menton, traditional seaside resorts such as Villefranche-sur-Mer, and several very lovely villages in the mountains to the north such as Sainte-Agnes and Gorbio. Our favourite way to explore the coast here is by taking the small train that runs between Italy and Nice (any beyond), operates a frequent and cheap service and stops at all of the interesting destinations - a much more relaxing way to explore the coast near Roquebrune than driving on the busy roads and searching for a parking space - see Nice-Menton coast train.